BeenThere-DoneThat: The Embankment area, London. 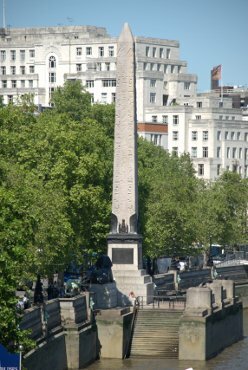 Cleopatra's Needle, on the Embankment, is the popular name for each of three ancient Egyptian obelisks re-erected in London, Paris, and New York City during the nineteenth century. The London and New York ones are a pair, while the Paris one comes from a different original site where its twin remains. Although the needles are genuine ancient Egyptian obelisks, they are somewhat misnamed as they have no connection with Queen Cleopatra and were already over a thousand years old in her lifetime. The view east along the River Thames, seen from the Golden Jubilee Bridge, with the dome of St. Paul's Cathedral showing above the trees, the 'Gherkin' in the city and the trees along the Victoria Embankment on the left. This shows half of the Golden Jubilee Bridge. The other half is on the other side of the railway bridge on the right of the picture. The two sections are quite separate and each has its own access steps and lift. The original footbridge gained a reputation for being narrow, dilapidated and dangerous so it was replaced with two new 13 ft wide footbridges in 2002. 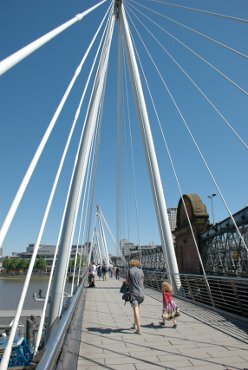 They were named the Golden Jubilee Bridges, in honour of the fiftieth anniversary of Queen Elizabeth II's accession, although they are still often referred to as the "Hungerford Footbridges". 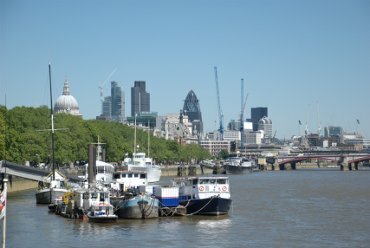 Crossing from the Embankment takes you to near the London Eye on the south bank of the River Thames. 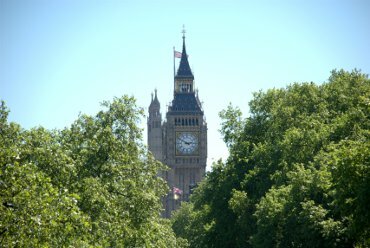 A view of the Big Ben clock tower from the Embankment. with apologies to Rupert Brooke.